Cook noodles according to package directions. Meanwhile, combine black bean paste and mirin; mix well. Press the block of tofu between paper towels to absorb excess moisture. Cut tofu into 3/4-inch slices; cut slices into 1-inch squares. Toss tofu with 2 tablespoons black bean mixture and set aside. Heat a large deep nonstick skillet over medium-high heat. Add 1 teaspoon of the oil, garlic and the bok choy stems; stir-fry 2 minutes. 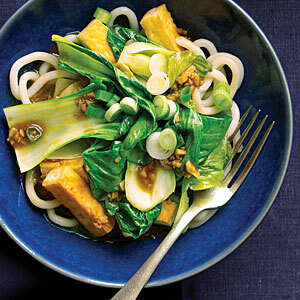 Add bok choy leaves, carrots and tofu mixture; stir-fry 2 minutes or until the vegetables are crisp-tender. Add salt to taste to the vegetable mixture. Drain noodles; toss with remaining black bean mixture and remaining 2 teaspoons sesame oil. Transfer to serving plates. Spoon tofu mixture over noodles; garnish with radish if desired. Pickled ginger, also located in the ethnic section of your supermarket adds a new, sweet-sour dimension to this dish. Sprinkle a little on, or just drizzle the juice from the jar to make this dish really pop—that juice is usually just vinegar, with a little salt and a little sugar, and it makes a lot of flavor difference. Hoisin or teriyaki sauce may replace the black bean sauce—both will make the dish much sweeter, but still tasty. Whole wheat wide ribbon pasta—like a fettuccine—can replace udon, which is made from buckwheat. Black bean garlic sauce can replace the black bean sauce here—look for it, mirin and udon noodles, in the Asian section of your supermarket.